Just thinking about these brain-sucking creatures gives me the creeps. Yet, day after day, children of all ages ask me if there are any books on Zombies. (“Zobmies,” asks a savvy 3-year-old) According to Rebecca L. Johnson, zombies do exists, only more of the insect variety. Whew! 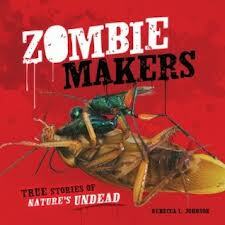 In Zombie Makers: True Stories of Nature’s Undead we learn about a few things that can take over the bodies and brains of innocent creatures, turning them into senseless slaves. Find out about the fly-enslaved fungus, suicide worm, and the Jewel Wasp that lays its eggs inside a cockroach. When hatched, the jewel wasp larvae feasts on the roach’s organs. Delicious! The book’s cover is eye-catching. All in red, we see a close-up photograph of a jewel wasp attacking a cockroach. 5 chapters, each four pages long, include color photographs of the subject and side bars with scientific facts. The writing is entertaining and informative, and Johnson includes a phonetic pronunciation for all the scientific names. Readers will learn how the fungus, insect, or virus attacks its victim and then takes total control. Hey, it’s nature! Take, for example, the hairworms (Paragordius tricuspidatus). They take control of crickets, the hairworms true host. Tiny insects, those that begin life in the water, are infected by tiny young forms of the hairworm. The hairworm larvae didn’t hurt the insect they infected. They just curled up to form little balls, called cysts, inside them. 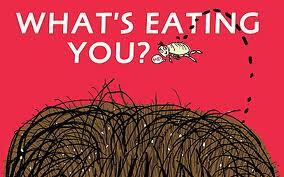 The larvae waited as cysts until the insects died and were eaten by crickets. Once inside the cricket the larvae nibble on their host and grow until nearly 3 feet (1 meter) long. To fit inside the cricket it must loop, coil, and knot itself. Once fully grown and needing the water to reproduce, the worms release a chemical inside the crickets brains that makes the cricket think it needs water. (Crickets can’t swim) The crickets hurl themselves in the water and drown, at which time the hairworm quickly wiggles out of their dead or dying host. It’s not a pretty sight. In an afterword, Johnson explains why zombie makers go to so much trouble to invade and control their hosts. All living things reproduce to make more of their own kind. If they didn’t do it, they’d die out. An author’s note, glossary, source notes, selected bibliography, web sites, and an index rounds out this fascinating look at insects. Hand this to a bunch of students during a classroom visit and you’ll find them sitting in the corner reading completely absorbed. Other books about parasites include: What’s Eating You: parasites---the inside story by Nicola Davies and Gross Universe: your guide to all disgusting things under the sun by Jeff Szpirglas.